Bryan was determined to see some good meteors this year. DETERMINED. Our Orionids had been rained out, and our Leonids had been somewhat spoiled by the experience of driving around for an hour looking for a nonexistent viewing spot and then lying on the concrete in front of a dark fire station hoping not to get run over. 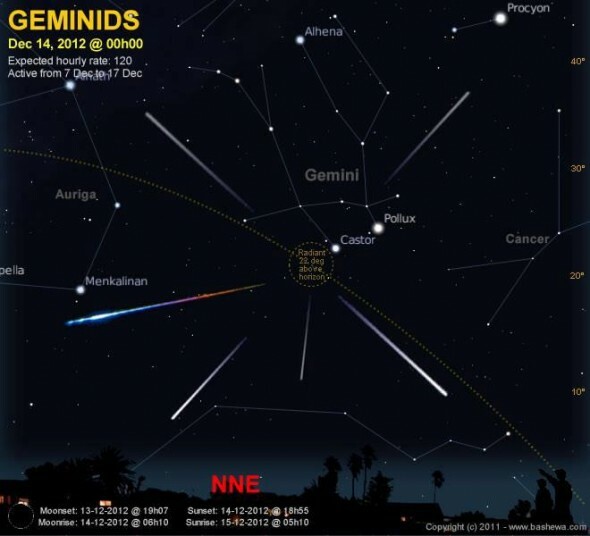 The Geminids, though - they looked promising. A new moon and clear skies were going to line up perfectly. Some astronomers even predicted the co-occurrence of another, more minor meteor shower! Bryan planned carefully. He invited our friends Cliff and Mitch and their kids, and he packed a stove and hot chocolate mix and air mattresses and lots of blankets. We had our good binoculars, and Mitch brought his telescope. We met at Williams Junction, where highways 9 and 10 meet west of Little Rock, and drove a caravan to Flatside Pinnacle. The parking area there is nice and flat, the glow of Little Rock is blocked by the mountain, and the skies to the west are dark over the wilderness area. This time, we weren't disappointed. We snuggled into our blankets and watched dozens of meteors streak across the sky. Most radiated from Gemini as it rose, of course. But there were a good handful angled perpendicular to those, was that the second shower or just random other bits of space dust? Some streaks were faint but many were big and slow and really impressively bright. Some even trailed glowing stuff behind them. The rest of us took turns dozing, but Bryan stayed up all night and watched. Just before we packed up our things to head home, about two-thirty in the morning, we saw a meteor so bright it lit our upturned faces and cast shadows behind us. Here we are, friends, on a big rock we call home. Sometimes we need reminding that ours is not the only rock out there.